Immerse yourself in the majesty and music of West Africa in this epic story of Mali. Be swept away by the passion and majesty of this epic tale of love, courage, faith and strength that has been told in Mali for many hundreds of years. Experience the heart of a land where beautiful, undulating desert dunes and giant baobab trees meet magnificent sandstone villages carved into cliff faces. Discover a royal family, torn apart by jealousy, plots and exile, unsettled by a prophecy which hinges on the most reviled woman in the kingdom. Can a child, born of a humiliated mother and shape-shifting grandmother bring the kingdoms of West Africa together? A story told for hundreds of years. A story of courage, faith and strength. The Birth of Sundiata Keita, visionary leader of the great Malian empire, is told across West Africa as a history of kingship and battle. Jan Blake, one of the world’s leading and best-loved storytellers, together with two exceptional West African born musicians, Kouame Sereba and Raymond Sereba, share a rarely told perspective on the story of the extraordinary circumstances of this legendary leader’s birth. 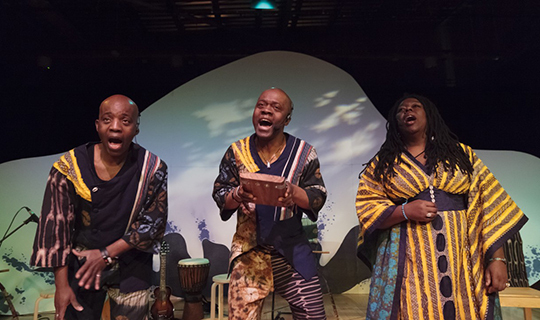 Filled with songs of the Gban people, The Old Woman, the Buffalo and the Lion of Manding, has energised audiences across the UK and Europe from Hay on Wye Literature Festival to Netherland’s Zwolle Unlimited Festival to the RSC in Stratford-upon-Avon. Guitars, Nordic flutes, djembe drums and kalimbas along with the extraordinary dodo mouth bow, cradle the story in an evocative soundscape. This story reaches across the centuries, from its origins in 13th Century Africa to the recent conflicts of our own time when its telling was forbidden. Enjoy a performance that is by turns delicate, dramatic, moving and truly uplifting.